Robert Gilbert, a 68-year-old former high school teacher and military veteran, surged to the lead after the final mandatory race went into the books during Day 1 of the 20th NTRA National Horseplayers Championship (NHC) Presented by Racetrack Television Network, STATS Race Lens™ and Treasure Island Las Vegas, topping the leaderboard with a mythical bankroll of $198.20. Gilbert's first-day total is the second highest score since the NHC went to an 18-race per day format in 2016. A resident of Yardley, PA Gilbert is a five-time NHC qualifier with his best finish being a 37th place effort in 2016. He started his day off on a big note when he cashed on 15-1 shot Wicked Boy in the day's first mandatory race – the fourth at Tampa Bay Downs. He further padded his bankroll when he had 7-1 shot Headland in the fifth at Oaklawn but his biggest scores came in the form of 40-1 winner Unk's Red Man in the ninth at Fair Grounds and Forestation, who delivered at 20-1 in the fifth at Santa Anita. Gilbert finished 47th on the NHC Tour this season and captured a HorsePlayers.com tournament on Sept. 15, 2018. That tournament win in September was among the seven top-3 finishes Gilbert notched in online tournaments during the 2018 season. As Day 1 leader, Gilbert earned a Breeders' Cup Betting Challenge entry. John Pinder is a close second on the leaderboard with a bankroll of $184 and Matthew Ache is third with $150.20. Christian Hellmers ($150) and William Haliziw ($149.60) round out the top five. Joe Rosen, the leading rookie on the NHC Tour for the 2018-19, had a beyond-his-expectations outing during his initial foray into the deep NHC waters. The 49-year-old partner in Little Red Feather Racing ended the first day sixth on the leaderboard with a mythical bankroll of $141.90. Not only is the California native well positioned heading into the second day of handicapping, he is eligible for an exclusive $1 million bonus offered by Little Red Feather to the partner with the highest finish on the Tour if that player can go on to win the NHC main event. Rosen had fate swing to his side early on. When Vital, his pick in the day's first mandatory race was a late scratch after flipping in the gate, Rosen landed on Wicked Boy who went on to score by a neck in the one-mile turf test. “I'm just blown away,” said Rosen, who is a dual qualifier. “I got a little lucky on that first mandatory race. I had the favorite that got scratched right at the beginning and got my pick switched to the longshot I also liked at 15-1. That gave me a good start to the day. It's been a slow build up. I got a little lucky, had some close wins at the wire and it's just been an incredible day. Both Rosen and Gilbert are STATS Race Lens users. The Top 10 is rounded out by Darwin Labordo ($144.80), David Durkin and Stephan Gravina tied for eighth with $143.80, and Pat Stich ($142). Defending NHC champion Chris Littlemore is sitting in 18th with a bankroll of $130.40, a spot he feels more than sets him up for a shot at making history to become the tournament's first ever two-time champion. “It's about the same. I think I'm five bucks ahead of last year,” Littlemore said. “I don't know for sure but that's where I'm sitting. I don't know exactly where I am (on the leaderboard) but I don't think the leader last year had quite as big a score as this year. So, it could be a little tougher. Full standings can be viewed online at NTRA.com. NHC entrants were required to place 18 mythical $2 Win and Place wagers – eight on mandatory races that everyone played and 10 on any of the other races from eight designated racetracks across the country. The three-day NHC continues Saturday at Treasure Island. Day 1 bankrolls will carry over to Day 2, which will require mythical wagers on eight mandatory races and 10 optional plays. 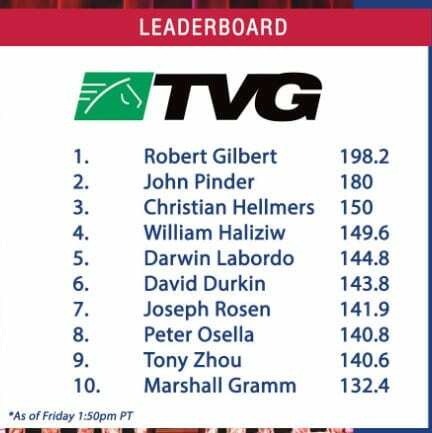 The top 10 percent of the field after Day 2 will continue on to the Semifinal round Sunday and the top 10 will play at the Final Table to determine the ultimate rankings, including the $800,000 grand prize and Eclipse Award winner as Horseplayer of the Year. Players outside the final cut will play in a separate $50,000 Consolation Tournament on Sunday with reset mythical bankrolls. This entry was posted in Horseplayers, NL List and tagged fair grounds, horseplayers, joe rosen, national horseplayers championship, NHC, NTRA, robert gilbert, santa anita, tampa bay downs by NTRA. Bookmark the permalink.